Capital Forensics is engaged by respected firms and their legal advisors to help resolve complex issues, involving significant financial and reputational risks. We take that responsibility very seriously. CFI has decades of experience in all aspects of litigation and case resolution. This incorporates early dispute resolution, mediation and arbitration (including arbitrator rankings) based on complaints, as well as litigation in state and federal courts. Contact us with any issue that involves litigation support. Our executive team consists of experienced professionals who are highly regarded within their respective disciplines. Our team of expert witnesses possesses deep subject matter expertise, covering every financial asset class and function, including accounting, legal, operational, regulatory matters and quantitative analytics. They have earned the respect and credibility necessary to provide effective and persuasive testimony. Our proprietary account reconstruction process provides CFI analysts with a reliable methodology for review of essential metrics – such as financial account performance, cash flow analysis, portfolio turnover, expense-to-equity ratios – enabling them to provide clients with conclusions supported by hard facts. Our analysts find the hidden story in the data, and design and implement strategies to communicate those findings authoritatively. Leveraging a GIPS-compliant system, our analysts produce flexible, adaptable, comprehensive reports, necessary for effective analysis and testimony. These reports often serve as the basis for instructive exhibits in litigation and arbitrations. CFI has established a reputation for producing precise and persuasive reports. The firm is constantly developing new and unique data models to create customized solutions for our clients. CFI’s team of expert witnesses possess deep subject matter expertise covering every financial asset class and function, and have earned the respect and credibility necessary to provide effective testimony. 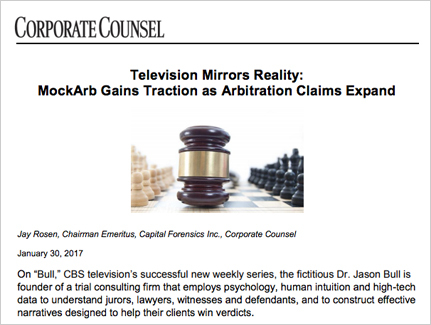 CFI has developed the industry’s most robust and effective portfolio of tools and tactics to plan and implement an arbitration-based strategy. The portfolio consists of the ArbReporter®, ArbSelector® and MockArb® platforms. 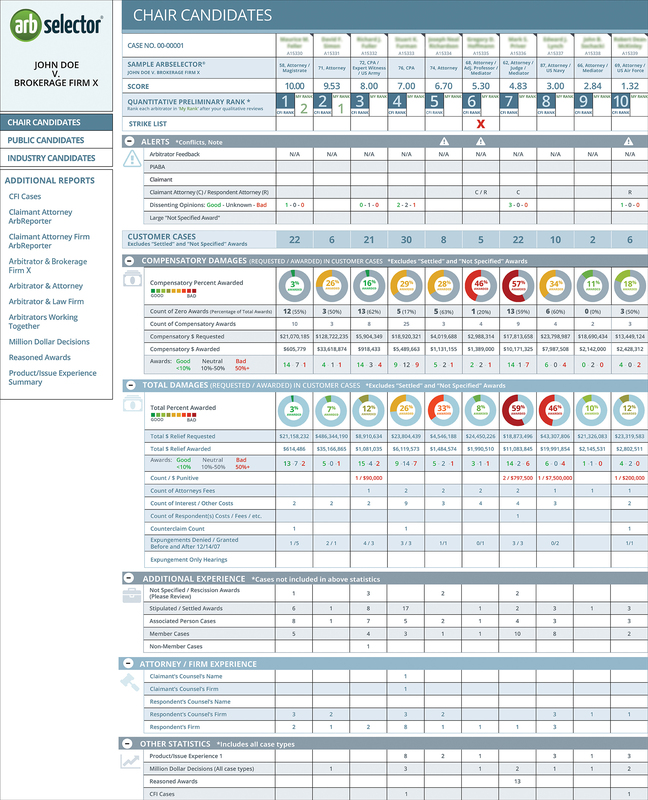 ArbSelector® is a comprehensive and interactive report that summarizes each potential FINRA arbitrator’s awards, key cases and red flags – ranking each prospective panelist, based on more than 12 different metrics. ArbSelector® provides attorneys and paralegals with a statistical overview that reduces the time and expense involved in making fully informed, quantitative, side-by-side evaluations of arbitrators, based on their prior cases and awards. What makes ArbSelector® unique is that it provides dissenting opinions, how final panelists ruled on previous cases in which they were co-panelists, and how they ruled on specific cases similar to the issues in a client’s current matter. Scroll over image to enlarge. ArbReporter® is a weekly email communication – sent as a courtesy to Capital Forensics’ clients and other industry professionals upon request – that provides a comprehensive report of all FINRA awards from the prior week. ArbReporter® is a convenient tool for keeping up-to-date on FINRA arbitration activity. 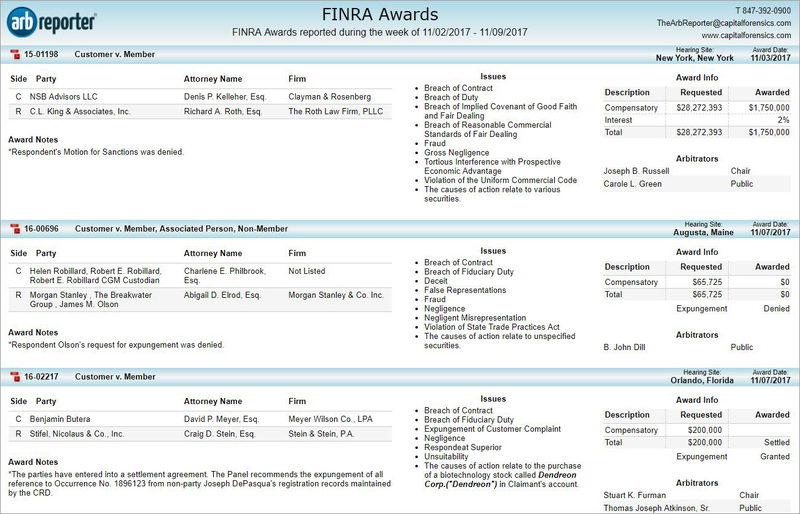 Extracted directly from FINRA records, ArbReporter® contains all of the essential information, covering the nature of the case, relief requests, all arbitrators involved, claimant and respondent, case disposition including any award amount and other damages, attorney names and affiliations. SUBSCRIBE HERE. Customer complaints across all industries, and in financial services in particular, continue to grow in volume and complexity. To properly address complaints – in terms of financial outcomes, brand reputation and customer loyalty – companies must have access to a range of tactics that can be applied to achieve successful outcomes. Because there is no “one size fits all” approach to complaint resolution, CFI provides clients with a portfolio of services that cover the full range and complete lifecycle of customer complaints. CFI is prepared to assist clients in responding to customer complaints, by recommending and applying strategies and tactics with the highest likelihood of success, in the most cost-effective manner, and with the greatest long-term benefit to the client’s reputation. CFI’s accounting capabilities deliver world class reporting. CFI has the ability to discover and present critical information. CFI provides innovative solutions to resolve complaints. CFI has the industry’s most extensive portfolio of Arbitration tools. CFI helps clients to avoid and respond to regulatory scrutiny. CFI’s expert witnesses deliver an unmatched level of service.